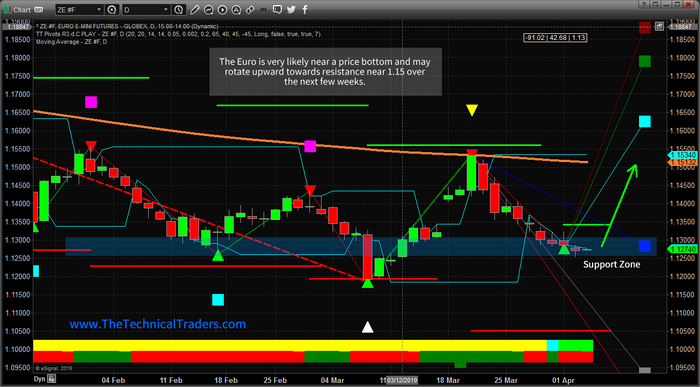 Euro Dollar Price Bottoming Setup - Technical Traders Ltd. - Investment Strategies, Analysis & Intelligence for Seasoned Investors. Skilled traders should watch for any breakout above 1.134 as confirmation of the upside price rally and target 1.15 or higher. This could also drive the US Dollar a bit weaker over this same time-span. Might be an excellent setup for quick profits. Do you want to find a team of dedicated researchers and traders that can help you find and execute more winning trades in 2019 and beyond visit our trade alert newsletter at www.TheTechnicalTraders.com or learn our trading techniques through our Trading Courses today?